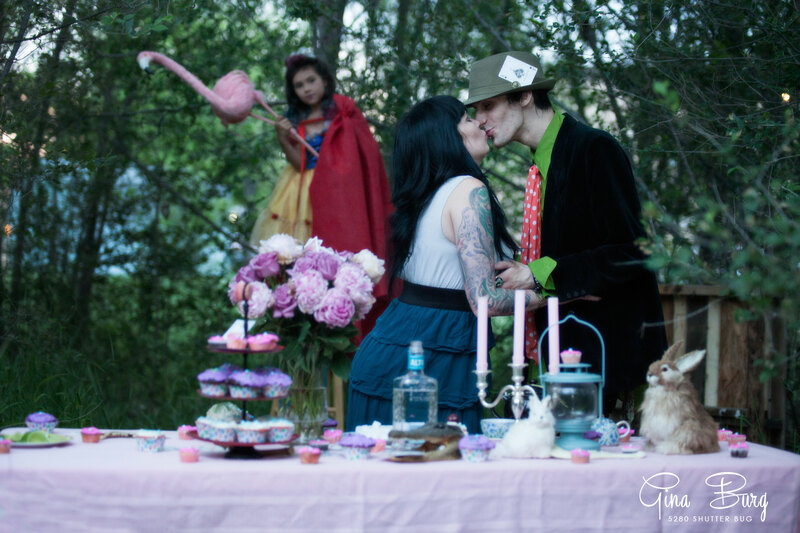 I cannot even begin to express my excitement about this Mad Hatters Tea Party themed wedding shoot. 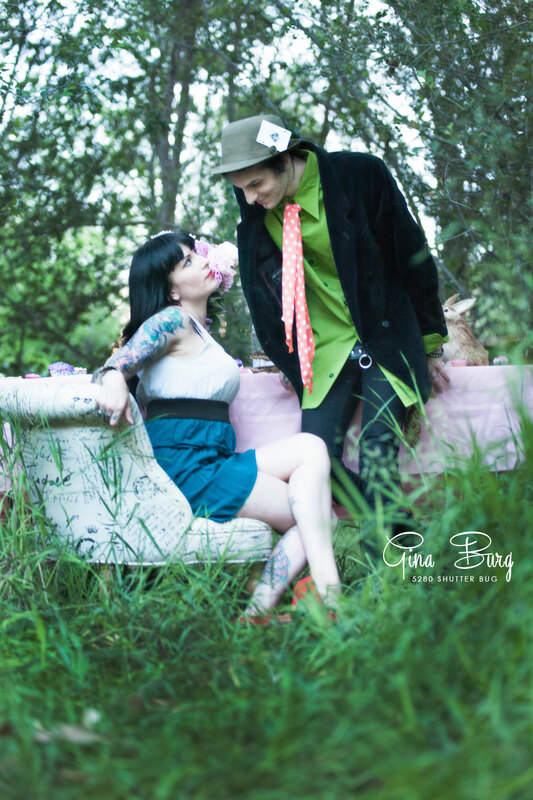 I have known these two characters for awhile now and when Johnny and Ina eloped a couple years ago they never got to take engagement or wedding photos. 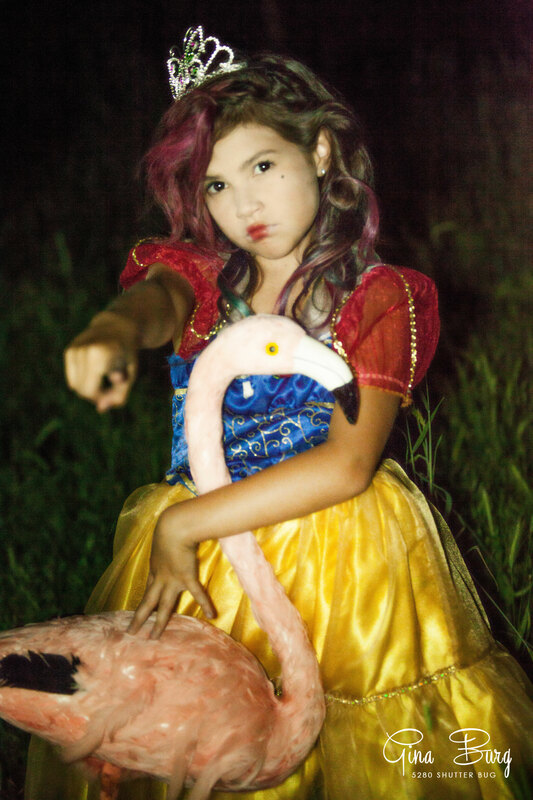 When she told me that, we started plotting ideas for a photo shoot. Ina is an incredibly talented crafter who collects and creates all kinds of crazy items from mandibles, jewelry, art, all the way to real taxidermy. Johnny has a style and presence all his own that to me screams 80’s glam/ LA chic. Adding to their quirky awesomeness is their family includes hedgehogs and crew of crazy puppies and then you get a small inkling of who they are. 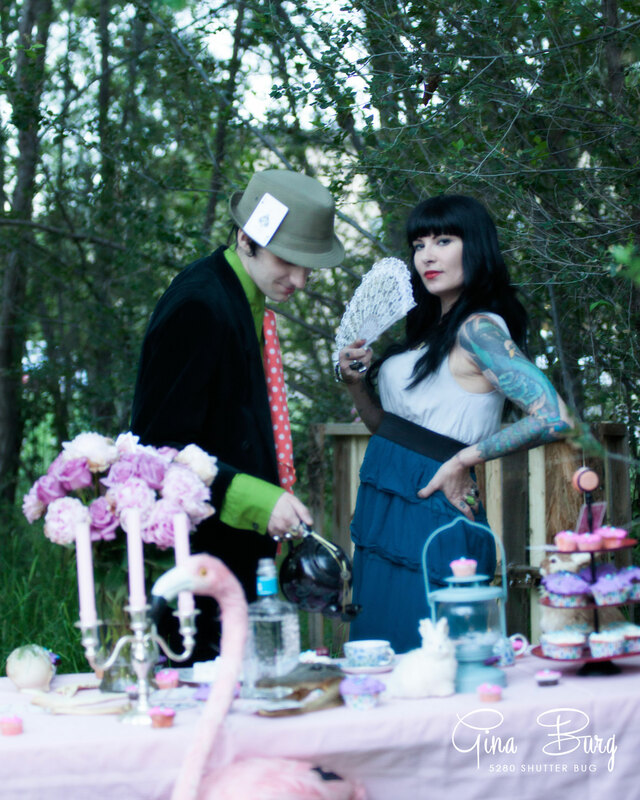 One day Johnny was sporting a funky hat and Ina had bleached her hair blonde and it all clicked together; A MAD HATTER’S TEA PARTY was what we needed to shoot! To prepare for the shoot, my kiddo and I spent the day baking what seemed like a million cupcakes. 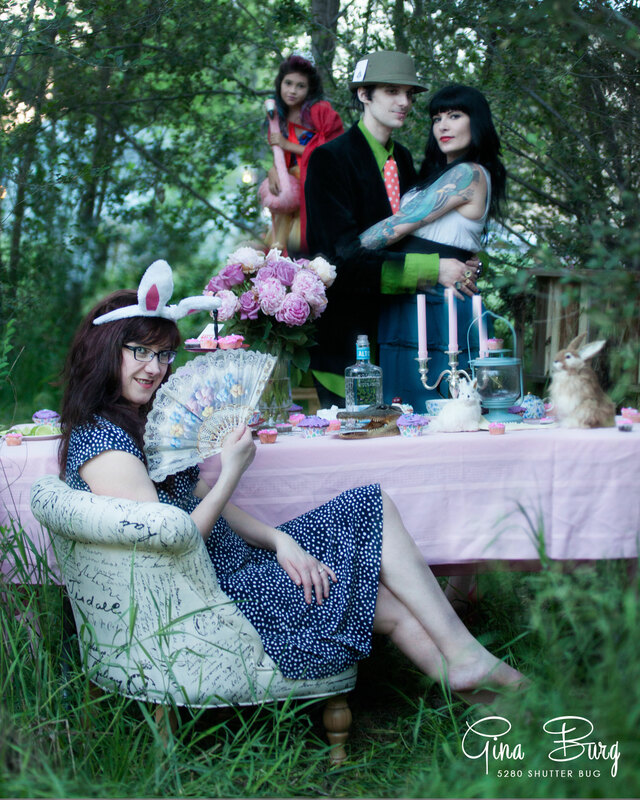 We also stumbled upon a pink flamingo and my friend Jenny, a literary genius brought over all her special tea kettles and tea cups while Ina and Johnny brought all kinds of decorations for the table. 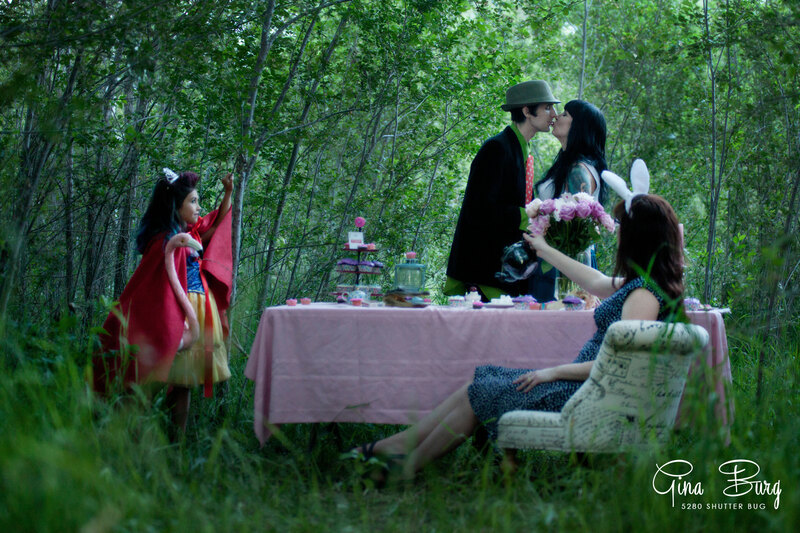 Sloane dressed as the red queen, Jenny the white rabbit and of course Johnny as the Mad Hatter and Ina as Alice. At sunset we set everything up an went wild! I hope you enjoy these photos as much as we do!